Seeing my photographs first hand over the years, my good friend Ron mentioned to me one day about Battery Park City, as he passed through it a number of times to and from some of his tennis tournaments. "The landscaping there is superbly done, you really should see it." So one day on a trip into the city on one of my days off, I left early enough to casually pass through the large park. Ron wasn't exaggerating. As I walked up the esplanade on that warm sunny afternoon I kept imagining the sunset shots I was going to get here with my new DSLR camera. With all the rain in 09' it wasn't until July that I finally got the opportunity to bring along my camera on a clear night when I was off from work. 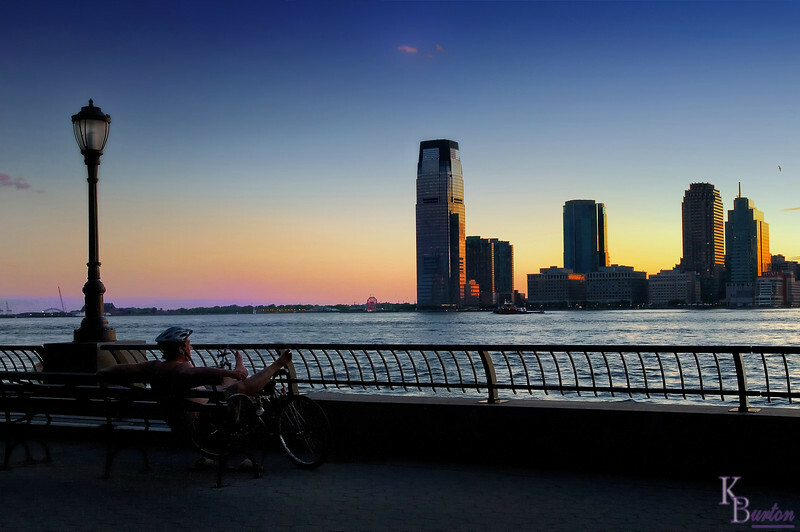 Blissfully enjoying a wonderful summer evening at a place I could see would surely become a new favorite photo opp spot, I enthusiastically headed up north gazing at the New Jersey skyline as it became draped in a spectacular rainbow of colors. Looking for a photo that would truly be worthy of this marvelous evening I kept viewing and rejecting a dozen different scenes as they appeared in front of me in rapid fire succession. Just as the available light needed to shoot hand held started to dwindle, as if on cue, I came upon a young man sitting on a bench with his feet resting on his bicycle. The kind of shot I had been dreaming of for more than 6 months was now spread out right in front of me. "Time to finally see if my D300 can take night time shots as superbly as my old F3 did back when I loaded it with Kodachrome". Oh yes it can, I delightfully discovered - oh yes it can. Brilliant. Just enough to show some details of the guy.